Mamaearth Charcoal, Coffee and Clay Face Mask is very helpful when you feel your face is looking dull. It gives back your skin its original shine and glow. It is made up of cucumber, papaya and mulberry extracts which eliminate toxins and also reduces blemishes. 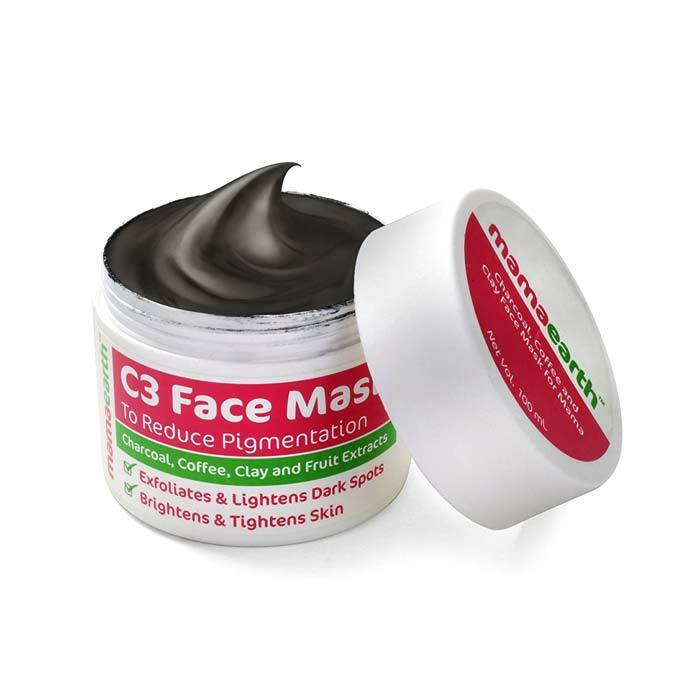 Presence of activated charcoal and kaolin clay gets rid of the dead skin cells thereby reducing inflammation of skin. It will brighten the skin and give it a even toned look because of the coffee extracts present in it. Avoiding the area around eyes, apply a thick layer of Mamaearth Charcoal, Coffee and Clay Face Mask on face and neck area. Leave it to dry for 10 minutes. Rub the skin in circular motion while removing the mask. This will also exfoliate the skin. Wash your face with lukewarm water and then dry. Apply moisturizer. 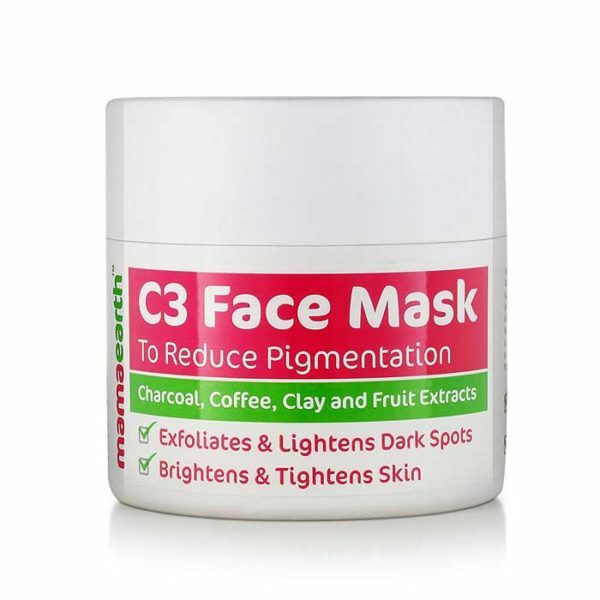 Coffee, Kaolin Clay, Charcoal, Bentonite clay, Papaya extract, Cucumber extract, Kokum butter, Mulberry extract. Mamaearth Charcoal, Coffee and Clay Face Mask is filled with goodness of coffee, charcoal and clay. It reduces pigmentation of skin, exfoliates it and also gives a natural looking glow. Mamaearth is the only brand which is Madesafe certificate approved. They are 100% natural and made up of only organic and natural ingredients. 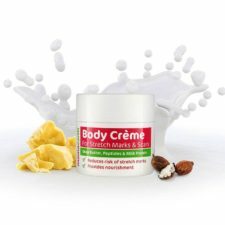 Since it has all organic and natural ingredients present, it is extremely safe on skin. Naturally derived ingredients have fewer allergens present so they do not cause any harmful reactions. 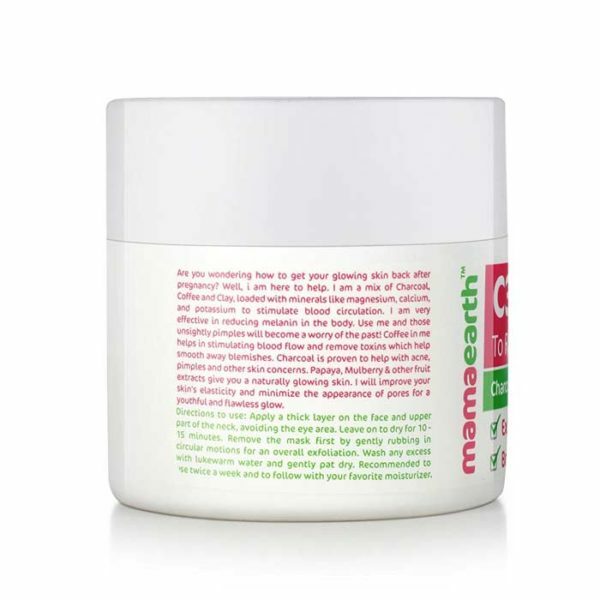 This face mask acts on the skin by increasing the blood flow, rushing nutrients and oxygen into each cell of skin. It is completely safe and also free from toxic agents such as parabens, sulfates, artificial fragrance, dyes, mineral oils etc. Activated charcoal helps to provide relief from irritated skin, pimples, acne, inflammation, pigmentation or any other skin concerns. It detoxes your skin and makes it smooth and glowing. 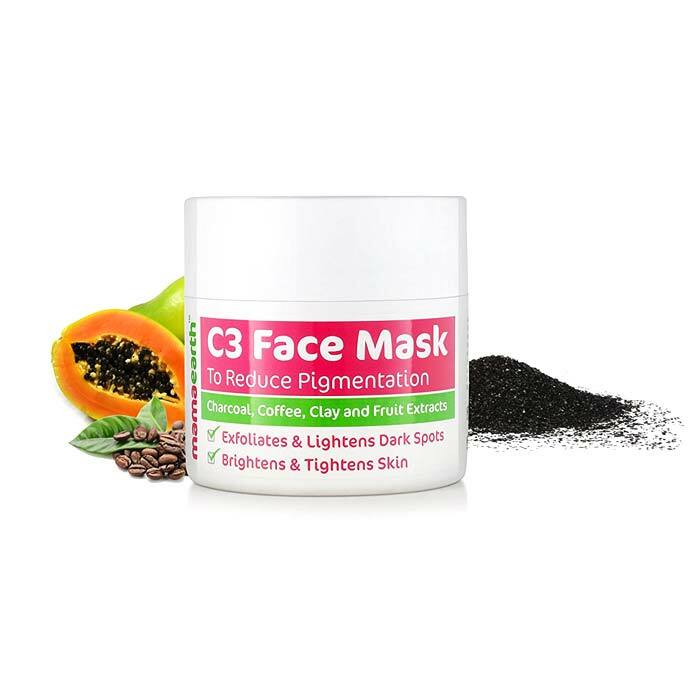 Presence of fruit extracts provide antioxidant properties thereby removing toxins and making the skin tone even.